Description: Cruis'n USA was One of the great classic arcade racers back in the 1990's. 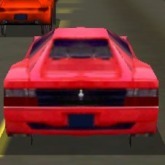 This game features a large variety of race cars to choose from and cool tracks from around the USA. Whats cool about this one the race tracks are more like highways actually from real-life location, so oncoming traffic can get in the way. Try to improve your lap times and come in first place in every race. There is a music button also, has some neat tunes in this one. Pretty challenging but very fun and memorable to play. Game Controls: Enter Key = Start Button. Arrow Keys = Move. Space Bar Key = Accelerate. "J" to change View. "K" to change music track. See In-game Controls to edit them, by clicking in-screen for more options.